Today, we had our annual Honors Day Assembly for the University and the Psychology Department. We give recognition to undergraduate students, graduate students, faculty, and staff who have excelled in various ways throughout the year. Congratulations to Ashley Stinson for winning the award for Outstanding Undergraduate Major in Psychology, Significant Contributions to Research in Psychology, Recognition of Psychology Honors Students, and Academic Excellence by a Major in Psychology! That's four awards in one afternoon, amazing! Also congratulations to Kyle Kraemer for receiving the Paul S. Siegel-Steven Apprentice-Dunn Teaching Award! Learn about the progress of our latest aging well intervention that was highlighted on SeniorHousingNews.com. Congrats to the Ashley Stinson (above left), William Miller (above center), Tori King (above right), and Brandon Lucas (not shown) who presented amazing posters at this year's URCA conference! A new clinical geropsychology graduate student has accepted admission to the lab! We look forward to welcoming Shayne Lin from the University of Colorado-Colorado Springs! Congrats to Ashley Stinson who won the first annual Hazel Phelps Jones Award! 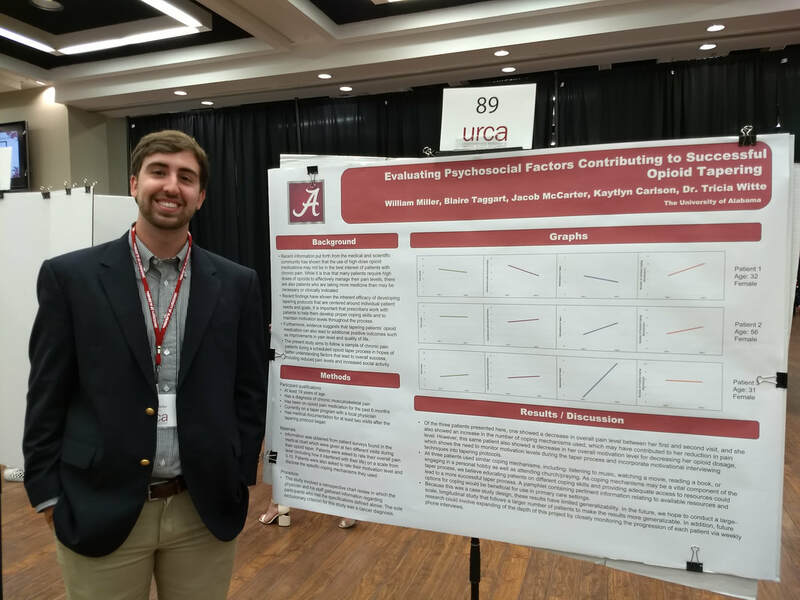 This award recognizes a senior majoring in the natural or social sciences, and who exhibits exemplary scholarship, leadership and service to The University of Alabama. A new clinical geropsychology graduate student has accepted admission to the lab! We look forward to welcoming Hannah Apostolou from the University of Michigan! Upon checking my mailbox, I was pleasantly surprised to see this Super Reviewer thermos from The Gerontologist! Congratulations to Ashley Stinson who won the Elizabeth A. Klonoff Diversifying Clinical Psychology Poster Award at the CUDCP conference! Her poster was titled, "Examining the Relationship Between Vascular Health and Brain Activation During an Association Episodic Memory Task in Middle-Aged and Older Adults." For a related submission, see our preprint at bioRxiv! We had multiple posters presented at the Annual Meeting of the Psychonomic Society! Unfortunately, most of the pictures came out blurry. Here is our UA (and guest) dinner! Congrats to Jessica Mendoza for winning a 1st place poster award at the Digital Media and Developing Minds 2018 National Congress at Cold Spring Harbor, New York! Find her publication that presents these data here! Her research investigated how the combination of having a cellphone and having nomophobia increases one's distraction, thus reducing attention and memory in a classroom! Tasnuva's poster on data from her Master's thesis received 3rd place at this year's APA Student Competition! Congrats! Her research focused on how perceptual and conceptual fluency are integrated to impact metamemory judgments! Look for the manuscript to come out in 2019! Our story made the front cover of Today's Geriatric Medicine! Welcome Jordan Puskas-Sullivan from Boston University! She will be interning in our lab for the summer! Our recent paper, "The effect of cellphones on attention and learning: The influences of time, distraction, and nomophobia," was featured on Psypost.org! We had multiple posters at the Cognitive Aging Conference, what fun! Congratulations to undergrads who presented our research at the Undergraduate Research and Creative Activities Conference: Mary Katherine Moore, Chris Mayhugh, Jordan Bolling, and Lauren McGuire! Lauren McGuire one first place in Preliminary Research! Lauren McGuire presenting her research on occupational physical activity and encoding-related brain activity. 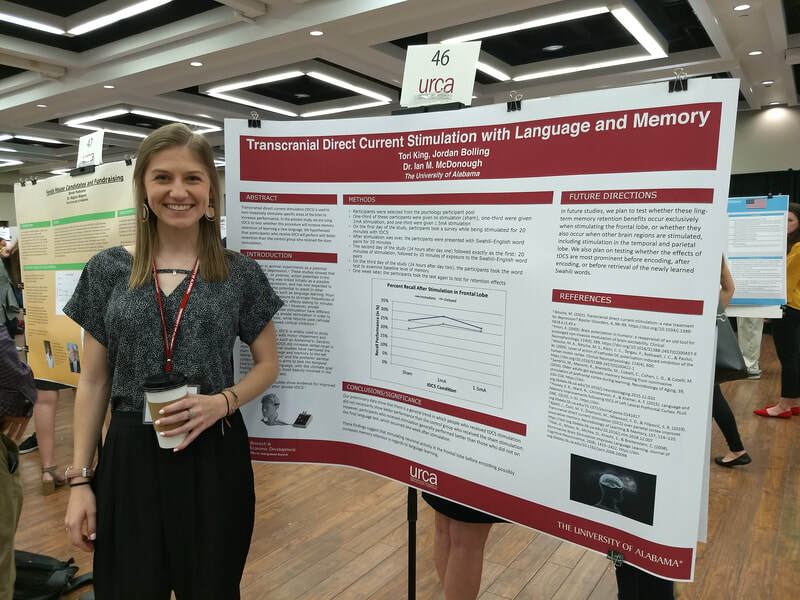 Jordan Bolling presenting her research on transcranial direct current stimulation to improve foreign-language learning. We have two new experimental graduate students joining the lab this Fall! Welcome Mikenzi Brasfield and Hillary Erwin! Our article was cited in an article from the Wall Street Journal written by the Pulitzer Prize winning Nicholas Carr entitled, "How Smartphones Hijack Our Minds." Two manuscripts were accepted this month: "Beta-Amyloid and Cortical Thickness Reveal Racial Disparities in Preclinical Alzheimer’s Disease" in Neuroimage: Clinical and "The Relation Between White Matter Microstructure and Network Complexity: Implications for Processing Efficiency" in Frontiers in Integrative Neuroscience. Welcome Sarah Letang, a new Clinical Psychology graduate student, to our lab! Congratulations to Kyle Kraemer for winning a travel award to the annual Psychonomic Society conference! Congratulations to Tasnuva Enam for her poster acceptance at the annual meeting of the Psychonomic Society this Fall entitled, "False memory and aging: the role of cognitive reserve in young-old and old-old adults." Congratulations to Kyle Kraemer for his poster acceptance and the Graduate Travel Award for the annual meeting of the Psychonomic Society this Fall entitled, "Understanding Metamemory: A General Ability or Separate Systems?" Dr. McDonough presented his findings entitled, "Beta-Amyloid and Cortical Thickness Reveal Racial Disparities in Preclinical Alzheimer’s Disease. " Dr. McDonough received the 2017 Charles Barkley Health Disparities Research Investigator Awards for first place in oral presentations at the 2017 UAB Health Disparities Research Symposium. April 9th at 5pm PST on KABC 790AM, Dr. McDonough will be featured the radio show In Your Right Mind! The lab is getting filmed working in Freesurfer for a fancy new video for the Psychology department! Congratulations to CeCe Hessler who got accepted into the Physical Therapy program at Washington University School of Medicine in St. Louis! "The busier the better: greater busyness is associated with better cognition" was recently featured on Texas NPR! Click here to read about! "Use it or lose it: Redefining an old idea" came out in Today's Geriatric Medicine. Dr. McDonough received The Matilda White Riley Early Stage Investigator Honors. Dr. McDonough was accepted to the 2016 Butler-Williams Scholar Program at NIA. Dr. McDonough is giving a talk in Granada, Spain entitled, "Fluid and crystallized discrepancy in healthy adults: The relationship with beta-amyloid and cortical thickness." Dr. McDonough is giving a talk in Cologne, Germany entitled, "Functional and molecular imaging in normal aging: Evidence from lifespan and intervention studies." A new article was accepted in Frontiers in Aging Neuroscience entitled, "The busier the better: greater busyness is associated with better cognition." We have two new undergraduates join the lab! Welcome Chris Mayhugh and Savanna Eosso! 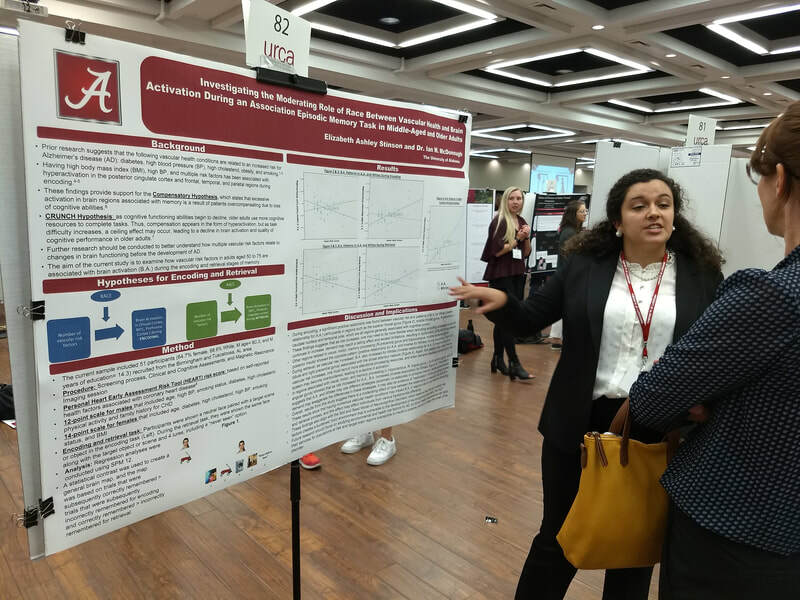 Tasnuva Enam presented a research proposal on metamemory at the 8th Annual Graduate Research Symposium of the Department of Educational Studies in Psychology, Research Methodology, and Counseling. CeCe Hessler wins multiple awards at UA's Honor's Day! Congrats! We have two new undergraduates join the lab! Welcome Catherine Reynolds and Katherine Beyer! A new article was accepted in the journal of Personality and Social Psychology Bulletin entitled, "Social-class differences in consumer choices and memory of others’ preferences in the US: The critical role of an independent vs. interdependent self-construal." The University of Southern Mississippi invited me to give a talk: "Retrieval expectations affect false memories." Dr. McDonough is giving a talk at the Alabama Research Institute on Aging on January 27th in AIME 111 at 12pm titled, "Cognitive and brain markers for preclinical Alzheimer’s disease." Poster presented at the 10th Human Amyloid Imaging meeting titled, "Fluid and crystallized discrepancy in healthy adults: The relationship with beta-amyloid and cortical thickness." We have a new undergraduate join the lab! Welcome CeCe Hessler! We have two new undergraduates join the lab! Welcome Todd Kirk and Ben Pody! Festini, S. B., McDonough, I. M., & Park, D. C. (November, 2015). Busyness across the adult lifespan: The busier the better. 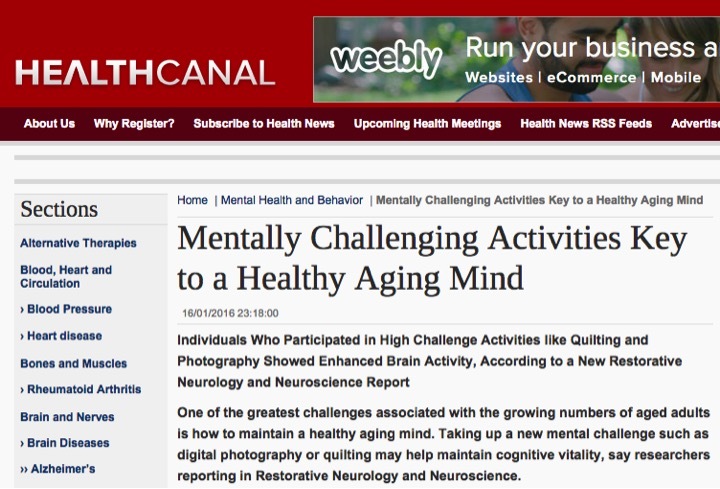 Dr. McDonough was featured in the Center for Vital Longevity newsletter. The Mac2 Lab is accepting new graduate student applications! Click here to apply! A new article was accepted in the journal of Restorative Neurology and Neuroscience entitled, "The Synapse project: Engagement in mentally challenging activities enhances neural efficiency." A new article was accepted in the journal of Acta Psychologica entitled, "Retrieval monitoring is influenced by information value: The interplay between importance and confidence on false memory." A new graduate student, Tasnuva Enam, joined the lab!